Noahpinion: How many economists are monetarists? How many economists are monetarists? Reading the econ blogosphere and talking to macroeconomists, you would think that the monetarists have triumphed. With the coming of QE3, the hard-money faction has suffered a decisive defeat in the policy arena. Mike Woodford is being hailed as a hero for our times, and the notable resemblance of QE3 to NGDP targeting has won Scott Sumner many accolades as well. Monetarism - broadly, the notion that economic fluctuations should be stabilized entirely through the monetary policy of an independent central bank - appears in the ascendance. 1. Most of these economists believe that slow recoveries are a natural result of financial crises. 2. The "policy uncertainty" trope has a good number of followers, despite the fact that there is probably substantial (and entirely political/partisan) disagreement as to what sort of policies people are worried about (socialist Obamacare, crazy Republican debt brinksmanship, or just a general failure of America's political institutions?). 3. A lot of economists seem to believe in fiscal stimulus. 4. 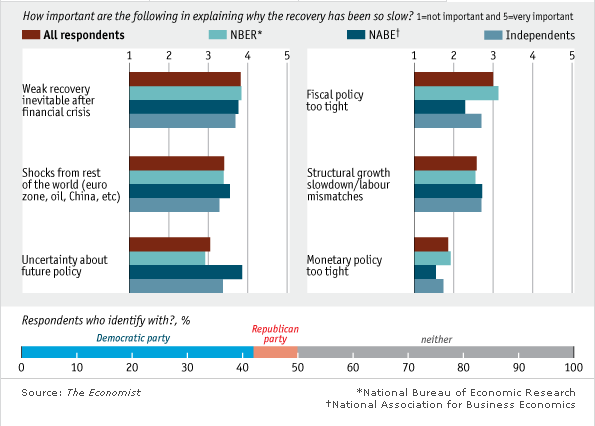 Most economists do not think that monetary policy has been a big factor in the slow recovery. All of these results are interesting, but to me, the last one is huge. Milton Friedman claimed that the Fed caused the Great Depression by keeping monetary policy too tight. Ben Bernanke agreed with this view. This survey shows that most economists (or, at least, most of those surveyed; it was not a random sample of the profession) now think that Milton Friedman was utterly wrong. This seems like a big deal to me because it signals a general lack of confidence in macroeconomics as a field. In recent years, most mainstream academic macro has modeled recessions as being due to demand shocks, and has focused on monetary policy as the most appropriate - or indeed the only - policy countermeasure. Fiscal stimulus is such a distant second that it might as well be running in a different race. Monetary policy - optimal rules, targets, expectations management - was and is considered the..er...gold standard of what macro has to offer the world in terms of practical, applicable engineering. What this survey shows is that many economists believe that our best macroeconomic policy engineers are unable to build any sort of useful machine. How would I respond if I took this survey? Basically, I agree that there is probably some force that holds back recoveries after financial crises (and we don't entirely understand what that force is, though many think it's related to gross indebtedness). And I think that uncertainty about external shocks is a huge deal - I wouldn't be surprised if there were "ringing" or "boomerang" effects as the crisis filtered slowly around the world and back. Also, I think we could have given the economy a much bigger boost by doing a lot more road and bridge repair. 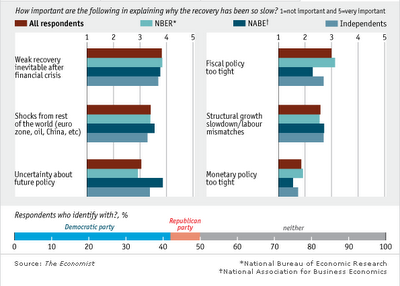 So except for the "policy uncertainty" part, I agree with the majority or surveyed economists. This seems to mischaracterize the position, at least of most prominent advocates for QE3 in the econoblogosphere: "the notion that economic fluctuations should be stabilized entirely through the monetary policy of an independent central bank." Do some of the people you cite as monetarists think that? Probably. But for the most part, Sumner, Woodford, and all the QE3 cheerleaders have really been saying "the monetary policy of an independent central bank can and should help ameliorate the current crisis/weak recovery." This is not incompatible with thinking more fiscal policy would help as well. And it doesn't mean they think bad monetary policy caused our current mess; just that better monetary policy could help clean it up. Mark Thoma, Bernanke, and many other economists have been quite vocal in support of more accomodative fiscal policy, but since that is clearly DOA in Congress, they are searching for any policy mechanism they can push past obstructionist Republicans, and monetary policy is one of the best available (others might include relief to underwater homeowners, but that's a stickier subject). Finally, I cannot stand the constant invocation of "financial crises always lead to deeper longer recessions" as an excuse not to fight the effects with policy. People always cite to Reinhart & Rogoff 2008 (http://www.nber.org/papers/w14656) on this, but in their paper they specifically say, essentially, that we can do better if we deploy more aggressive responses: "Some central banks have already shown an aggressiveness to act that was notably absent in the 1930s, or in the latter-day Japanese experience." Citing this paper as a reason not to act is like saying "the biggest tsunamis always kill the most people" is a reason NOT to send more aid in response to bigger tsunamis. Finally, I cannot stand the constant invocation of "financial crises always lead to deeper longer recessions" as an excuse not to fight the effects with policy. The beauty of printing money is it helps with that too! More inflation -> higher nominal home prices -> folks are less underwater on nominal mortgage values. And it helps millions of others lower the nominal value of their student loans. And it gives businesses a little more incentive to start using their giant money piles to, you know, do business: hire labor and capital. Sure. But a direct bailout of households would, in almost any model, be a faster way of lowering household debt than would inflation. Sumner, at least, has been quite clear about his opposition to fiscal stimulus. To be fair, if you ask economists whether 'monetary policy' caused the great depression, there would be huge disagreement, for one thing because monetary policy as you say is confusing, and I'd say ill defined. On the other hand, if you ask economists whether the great depression was a result of the treasury's (and France's) gold sterilization program (which is monetary policy, just not by the fed) a la Irwin combined with pessimism and low demand expectations brought about by the governments commitment to the gold standard, and by extension tight fiscal and monetary policy a la Eggertsson, I believe you'd find near universal agreement (with the exception of Austrians and some, not all, RBCists). I think one problem is that the questions are too vague. So you think the survey result is largely an artifact of the wording of the questions? Wait, hold on there. I think you made a big logical leap. That is, I think a respondent could both agree with Friedman and Bernanke about the Great Depression and also think tight monetary policy has not been a recent problem. All that requires in confusion about how to tell if monetary policy is tight. Which in the world (which is not the same as among economists, I know), is quite common. Is our economists learning ? However much esteem one had for Friedman, one should have less now that the Fed did what he said it should have done and there was still a great recession. My esteem has declined from mega gigantic to merely kilo-gigantic (others from terra-adulatory to merely giga-adulatory and some didn't think much of him in 2007). I don't know, I am not that big on Friedman...you have kilo-gigantic esteem for him? "Basically, I agree that there is probably some force that holds back recoveries after financial crises (and we don't entirely understand what that force is, though many think it's related to gross indebtedness)"
Gamble your home on a failed business idea and you'll have a very good idea what causes a financial crises. The only difference is scale. But how many entrepreneurs actually gamble their homes on their business ideas? Instead, they pitch their business plans to venture capitalists. And what do venture capitalists do? They hedge their bets. Why? Because most start ups will certainly fail. An once of prevention is worth two of cure. So stop spending your limited resources on trying to solve financial crises...and instead spend your limited resources on trying to understand how we prevent financial crises from occurring in the first place. Except, it really shouldn't take a rocket scientist to figure it out. We already know how to prevent financial crises from occurring. Just ask entrepreneurs...just ask venture capitalists. They'll tell you that we simply hedge our bets. Hedging our bets is also known as not putting all our eggs in one basket. It's also known as heterogeneous activity. If it makes a lot of sense on a small scale...then it should make even more sense on a larger scale. How much heterogeneous activity can we expect from 538 congresspeople who have to agree on how they spend 1/4 of our nation's revenue? You couldn't ask for a more perfect recipe for a financial crises. The solution is simply to allow 150 million taxpayers to choose how they spend their more than $3.5 trillion dollars in the public sector. Then we'll have heterogeneous activity for days. Focus on the word "bet" in the phrase...hedge your bets. Every investment is a gamble. Every time you spend your time/money you're gambling. You're gambling that the reward will be worth the risk. The more money you gamble with...the greater the potential reward...but the greater the potential financial risk. But who cares if you screw up when you're gambling with other people's money? Congress doesn't care when they screw up with taxpayer's money...you know why? Because they use it as an opportunity to blame the other side. Democrats say it was the Republican's fault and vice versa...and they've been doing that for the past 100 years. But it's not really congress's fault...it's our own fault for not understanding the value of our diverse perspectives, interests, concerns, hopes and dreams. Our diversity is our greatest strength and failing to apply this fundamental fact to the public sector will always result in depressions and recessions. I wouldn't dare tread on your dreams...so please don't tread on mine. My feeling is that the recent heightened interest in unconventional monetary policy will dissipate pretty rapidly after the election, since much of it is skin deep. A lot of Democrats got on the monetary policy bandwagon following the 2010 election, because they thought that a monetary stimulus was the only way to get some good economic news leading into this fall's election given the Republican hammerlock on fiscal policy, and would be needed to ensure Obama's re-election. That's why the calls grew particularly intense as the campaign moved into the summer. It will all be over soon, and Democrats will then go back to their traditional emphasis on fiscal policy. Sumner and friends will be wondering where half the fan club went. "Basically, I agree that there is probably some force that holds back recoveries after financial crises (and we don't entirely understand what that force is, though many think it's related to gross indebtedness)." Noah, I think this is slightly wrong. If it was "gross indebtedness" in itself that was the problem - maybe we just need to decide how much is too much and then we can predict the crash (a la Steve Keen)? But I don't believe that. I think wide spread indebtedness is indeed a problem, but in a way I think it reflects a symptom rather than a cause. We have an enormous hint in the current crisis. With a couple of exceptions (all of which are beneficiaries of the commodity boom), countries that have been hard hit were running trade deficits and countries that have done OK were running surpluses. So your response is "doh" trade deficits mean increases in borrowing. But think of the dynamics - not the fact of a level of borrowing, but the RATE of increase in borrowing (which is what the deficit is). These countries are seeing money regularly flowing out of the country, and have responded to the resulting threat to general prosperity by encouraging borrowing (i.e. lowering interest rates). Eventually if this keeps up, they run out ammunition - households and firms don't want to borrow any more and they hit the ZLB. Then this support stops. To grow again they have to change either their government deficits OR (better) improve their net export position. But for them to improve their net export position - those countries that have been doing OK have to worsen theirs (which they are reluctant to do - they have been getting richer, they are happy about it). So suddenly our cyclical problem has turned into a massive (international) structural problem. I don't really belong to any school of thought. I think the Austrians are mostly (at least most of the time) just wrong, but I also think the MMT people are too complacent about trade deficits and particularly about trade surplus countries and the lack of pressure on them. It is like hoarders in a closed economy model. Without inflation hoarders can be become a fatal leakage from the circular flow of money (hence Milton Friedman). maybe I'll expose my own policy views a bit more to make my point above clearer. 1. Countries should run full employment fiscal deficits roughly in parallel with growth in the private sectors in their countries, at least part of which should be monetarised. 2. This is because I think advanced countries shouldn't be in the business of expanding the average level of private debt as a proportion of the economy as a whole. 3. I think we need some international mechanism to actively encourage countries to be moving towards balance in their foreign trade accounts. (In other words we should be discouraging volatile flows of money between currencies). 4. We need to change those parts of national tax systems that reward indebtedness. So I want more monetary growth to come from government deficits than from debt growth. I don't think we should be encouraging private indebtedness. Sorry for the multiple posts, but what does this mean for economics? 1. It must concentrate much more on dynamics than on equilibrium. 2. It must recognise that growth in which their are growing trade deficits and growing levels of indebtedness is in NO SENSE equilibrium growth. The great moderation, was not a stable as it looked. Noah: "Monetarism - broadly, the notion that economic fluctuations should be stabilized entirely through the monetary policy of an independent central bank - appears in the ascendance." That's a fairly broad definition of "monetarism" (though it's still a meaningful definition). But by that standard, most macroeconomists were "monetarists" in 2007, and most stopped being "monetarists" when interest rates hit the ZLB, because they thought (unlike monetarists more narrowly defined) that monetary policy was interest rates, and so couldn't be loosened any more. You mean, I'm basically saying "Every macroeconomist who thinks that monetary policy stops being the most important type of countercyclical policy once the zero lower bound is reached, is not a monetarist"? ...as if Scott Sumner needed another thing to add to his 'I am oppressed minority' mentality. Friedman argued that the Fed could have prevented the Great Depression through more active policy. He did NOT claim the Fed caused the Great Depression. When your job is to a stable economy, is there a difference? Let me use a crude analogy: It's the difference between pushing a person off a bridge and watching a person being pushed off a bridge. I'd say there's a difference. Wouldn't you? Not if you're the designated bridge-catcher, you're in position to catch and you refuse to catch. Just because an institution can prevent a bad situation does not mean it caused the bad situation to occur. The two claims are not interchangeable. "This survey shows that most economists (or, at least, most of those surveyed; it was not a random sample of the profession) now think that Milton Friedman was utterly wrong." Uh, no. Anonymous has the Friedman argument correct: throw money at the problem and the problem would not have grown to the size it did. (In other "Sun appears to rise in the East" revelations, Friedman's alma mater spends too much money for the value on its football program. He wasn't wrong there, either; we still have a new, half-empty stadium and are cutting class offerings.) And Bernanke has been throwing money at banks to (choose one) (1) ridiculous excess, given what they are doing with it, or (2) abate the effects of the downturn and prevent the Lesser Depression from becoming GD II. I'll go with (3), all of the above. 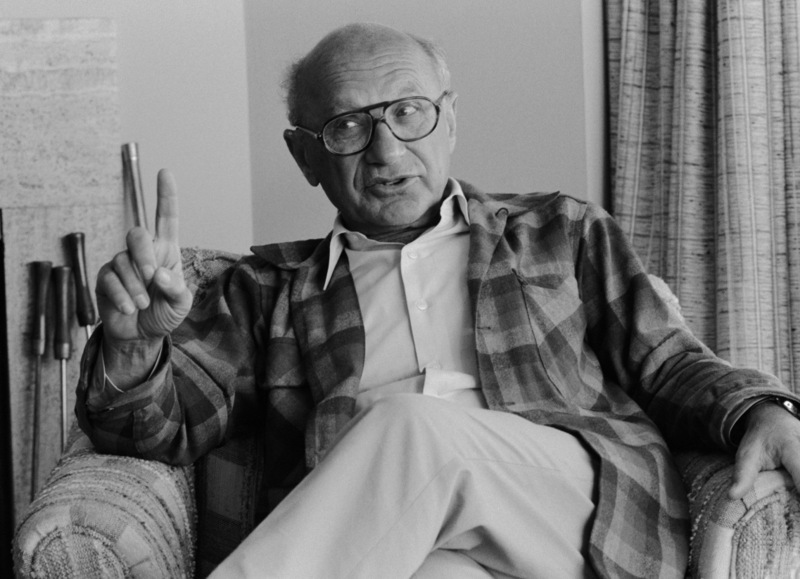 "This survey shows that most economists now think that Milton Friedman was utterly wrong." what???? no -- in the absence of expansionary monetary policy the economy would have been much worse. the fed may have prevented a second depression this time, but the point is that the fed has acted aggressively to increase the money supply at every possible turn, so whatever problems we have are likely not due to tight money. i would say: friedman was right, we learned from the depression, and we didn't make that mistake this time around. whatever is causing the slow recovery (which is not necessarily THAT slow compared to others) is due to other issues. But the survey shows that most of these economists think that monetary policy did all it could do...and yet the economy still stagnated. totally agree -- but i don't think this is inconsistent with friedman. friedman basically said that crappy monetary policy can amplify a recession. that's not saying the economy will never stagnate as long as monetary policy responds properly. i will bet if you asked economists "would the recession have been significantly worse without fed action (or if the fed actually raised rates like it did in 1931-32)", you would get a resounding yes. and that was exactly the friedman schwartz argument. Saying that tight monetary policy did not hold back the recovery is not the same as saying that a tighter monetary policy would not have held back the recovery. Monetary policy has been relatively loose in the recovery (unlike fiscal policy) and so as a point of history particular to this recession economists don't think monetary policy is a strong cause in this recession. If the Fed had raised interest rates in 2009 or 2010 then the survey might be entirely different. It's wrong to infer from the survey that economists don't think monetary policy is important in combating a recession, many may just think the Fed got it more or less correct, and so tight money did not hold back this recovery. Friedman had the good idea that Monetary Policy was the tool best suited to fine tune an economy. Monetary policy can take effect more rapidly than fiscal policy and avoid time lags. Friedman was also correct to note that management of the money supply would counteract stimulus attempts by political fiscal policy when an economy was already overheated. Friedman, however, oversold Monetary Policy and disrespected Fiscal Policy. To be fair, any product may need to be "oversold" to gain acceptance. The "monetarists" took it too far and have viewed Monetary Policy as the Major Policy and have tried to marginalize the importance of fiscal and regulatory policy. Friedman would never have been able to promote Monetary Policy as well as he did had not important Fiscal Policies that are automatic stabilizers (unemployment insurance, workman's comp, Social Security, &c) been in place. Automatic stabilizers are legislated in advance and trump the timeliness arguments against using Fiscal policy in a recession. Recent ideas such as an Infrastructure bank of projects that would receive additional funding and be accelerated during recessions are ways that FIscal Policy can be made more timely. A HUGE problem that caused the current crisis was inadequate regulatory policy. The Tech and the Housing Bubbles were readily apparent but those with regulatory authority were asleep at the wheel or chainsaw regulators ideologically opposed market rules. We do not have to accept the dualist construct of our host blogger. Economists with a nuanced view can see at least 3 legs to the policy stool, monetary, fiscal and regulatory. For the economy to hum, the policies need to work in concert as they did during the first 3/4 of the Clinton administration. Under Bush, we saw fiscal and monetary policy pulling in opposite directions while the regulatory leg was being chainsawed. In our current situation, Monetary policy is quite stimulatory but fiscal policy (when the states are added) is contracting- again pulling in opposite directions. The Lesson that Friedman and his strongest acolytes miss is that, "Monetary policy, no matter how good, cannot overcome bad fiscal policy." It is time to stop demonizing fiscal policy (as the TeaParty is wont to do) and start making it work in concert with monetary policy to fix our unemployment problem. "This survey shows that most economists ... now think that Milton Friedman was utterly wrong." That's not quite the same as the financial crisis -- but is related. Folks who thought they had $50k or $500k in equity, but find out they have -$10k, or only 30%, now have both a lot less than they expected (less demand) with a bigger desire to save more (higher propensity to save). To smooth their expected lifetime consumption. The 1995-2006 house bubble boom trend was unsustainable, and there is no sustainable policy to go back there. Huge temporary stimulus, either monetary or fiscal or both, might have appeared to help, but would more likely have resulted in more Solyndra style mal-investment waste. While increasing the net gov't debt. financial products that were wrongly rated AAA by S&P and Moody's. Where is the talk of reforming/ limiting the rating agencies? (i.e. allow no more that 100% of prior year's GDP to be rated AAA by any agency.) What was the 2006 total of AAA rated financial products? I've never seen that number nor discussion of it. "Indebtedness" folks should be quantifying it more. The bailout of LTCM led to the moral hazard of the big banks being careless (gov't run, tho privately financed. Bankruptcy would have been better). Economists such as yourself, Noah, who advocate rewarding the careless (to solve an immediate problem), promote such moral hazards which later cause bigger problems. If you're unwilling to do a $10 000 helicopter drop to each and every person, which would be "fair", then your short term econ only policy will likely lead to long term problems due to adverse incentives. If hard work is punished and/or laziness is rewarded, the culture gets more lazy. Careful - Careless. Responsible - Irresponsible. Thoughtful, considered - Thoughtless, whimsical. Honest - Dishonest. Without gov't redistribution, the market (of mostly peaceful, honest people making win-win deals) rewards the virtuous, who are more successful. With gov't, failure is rewarded. So there should be no surprise that there is more failure. Since there has been great monetary expansion, these economists may have already taken that into consideration when asked why the recovery was so slow. These results may not mean they were not in agreement with monetary policy but rather they felt that there was no more effect to be had.